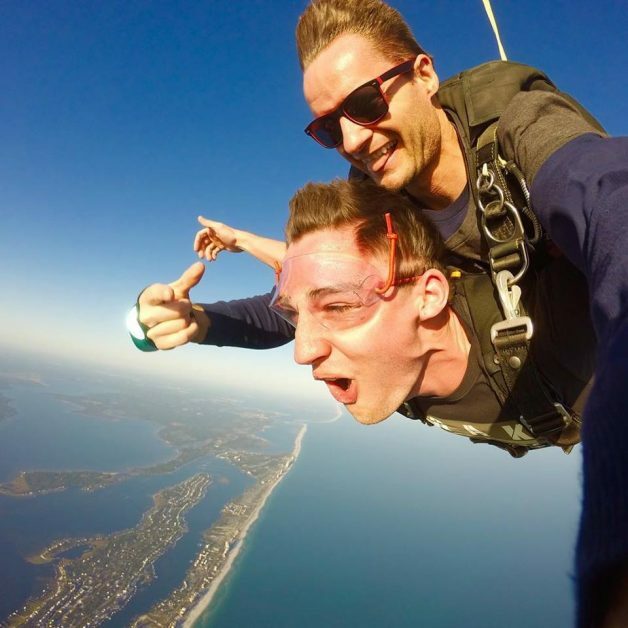 Deciding to take your first skydive is a huge step. Taking a little extra effort in planning your skydive can ensure an amazing and life-changing adventure! Your first skydive needs to be perfect and here at Skydive The Gulf we know there can only be one “first”. We want you to have every confidence in choosing us to provide this once in a lifetime experience. First in your planning should come research. You’ll want to be sure you found a skydiving center (also referred to as a dropzone) that has a good safety record, great customer service and strictly adheres to all safety related regulations. Not sure what exactly we mean by that? We are about to cover all the bases. Read on. You will want to be sure to check if the dropzone is a member of the United States Parachute Association (USPA). USPA focuses on promoting safe skydiving through training, licensing and instructor qualification programs. To be fair, just because a drop zone does not have USPA certification does not automatically make it less safe. However, all USPA member drop zones are required to follow the USPA safety requirements, use only USPA rated instructors and provide USPA required equipment. This is a once-in-a-lifetime experience for you; make sure to pick a place where people truly love what they do and care about giving you the time of your life. Most skydivers love their sport and enjoy their jobs; but then there’s also places that care more about the quantity of slots they sell and number of people they get through the door than the quality of the experience. Find some time to check the reviews on Google, Facebook and Yelp. If you’re not convinced, give them a call to chat with their staff or, if you’re close by, go check it out! While you’re there, ask for a tour. You can see the airplanes and facilities all while getting a sense of the level of care that that business puts towards their customers. 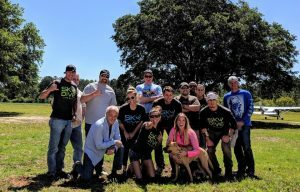 The crew here at Skydive The Gulf love showing off their home away from home. Come on by and we’ll share it with you! So you found a real-life, USPA member drop zone with exuberant and helpful staff? Time to book your jump! Consider this advice to make it extra memorable. The jump itself matters just as much as the memories you’re going to have about it for the rest of your life. Every experienced skydiver will tell you that investing into professional photos and video of your very first skydive is one of the best decisions you can make. 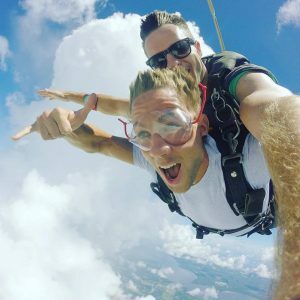 Your first skydive is an awe-inspiring sensory overload; looking back at the photos and video will help you relive every moment! And trust us, you’ll want to. Plus, you get to show your friends how bold and brazen you are! Let’s fast forward to the night before your jump. Save the party for after your land, and rest up! You’ll want to be as awake and aware as possible, so drink lots of water and get a good night’s rest. You’ll wake up refreshed and ready to jump out of a plane from 10,500 feet! And you will be all set to celebrate your jump after! Be like this rested, bright eyed fellow! We don’t recommend jumping on an empty stomach. You are preparing your body for a completely new experience and you want to make sure it is in tip-top condition. Eat a healthy moderate size meal before you jump. This will make your body happy, relaxed and ready to go! Always wear sneakers and make sure they’re tight enough so that the wind doesn’t take them right off. Wear something you feel comfortable in and pay attention to the weather! If it’s cold, wear long sleeves and pants and think about adding extra layers. It’s always a little colder in the sky than it is on the ground. If it’s hot, wear a tee and shorts. Remember, the staff is there to help! You did your research to find a dropzone with enthusiastic and friendly staff, so use that to your advantage! If you’re nervous, have questions, or even just want a high five to get you psyched up, the staff will be there to help. As you know by this point, making an incredible skydiving memory isn’t just about the jump itself. Every part of your visit is important and adds to your experience. A great dropzone knows that too! They will be there for you from the time you arrive to the time you leave, so feel free to hang out with them, ask any questions and make the most out of your time at the dropzone. Now you’ll be ready get on the plane and have the time of your life! 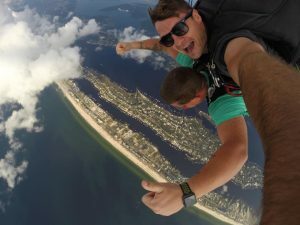 Skydive The Gulf is ready for you!